When Peter Farquhar and Kym Shilton decided to bring their three boys back home to Tasmania in 2015, they found the perfect 130-acre property in Legana, just north of Launceston. Bordered by Muddy Creek, which is much prettier than its name suggests, the farm had been owned by the Simmonds family for 70 years who worked it into one of the biggest apple orchards in the Tamar Valley. The apple industry in the north had all but perished by the 1980 but fortunately, 2500 apple and pear trees survived the cut and Peter and Kym inherited them all at Muddy Creek. With the help of the former owner, a crash course in orchard farming began, and there’s still a whole lot to learn. Gravenstein, crofton, cox’s orange pippin, red delicious, fuji, lady in the snow. They’re all still going strong along with 12 other varieties and six types of pear, including the original winter cole trees planted in 1915. And yes, they’re still bearing loads of fruit, and this year they’ll drop their 100th crop. 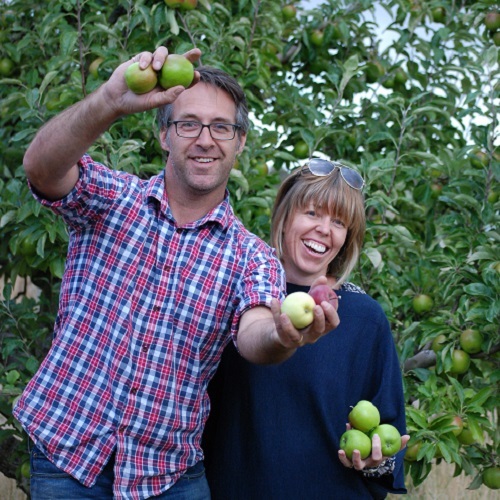 Peter and Kym sell all their fruit direct from the apple shed on weekends from February to July, as well as supply IGA in Exeter and speciality produce store Alps&Amici in East Launceston throughout the week. The fruit won’t be ready, but there’s plenty to see on the farm tour in November. It’s a beautiful time to be in the orchard with the bees, blossom and one of Tasmania’s only flocks of Shropshire sheep, which, in the early 1900s, were celebrated on dinner plates the world over. And then there’s the cider, and the cider shed, where Peter spends a lot of his time. It’s best described as experimental, he says. But you’re welcome to request a taste.